Since 1969, the program at 4 Corners Community Nursery (4CCN) offers many opportunities for children to develop listening skills, improve attention span, learn to follow directions, learn independent thinking, practice problem solving skills, and begin building a foundation in reading and mathematics, all while growing in confidence and self-esteem. 4CCN is a nonprofit, state licensed program. No child will be discriminated against because of race, color, national and ethnic origin, or disability. We offer your child a chance to spend time in a physical environment that is scaled to and planned for with a minimum of negative regulations about what they cannot touch or do. Each age group meets in large, separate, well-equipped classrooms. Age-appropriate activities include free play, crafts, music, story time, computers, and outdoor play in a large, fenced, fully-equipped playground. 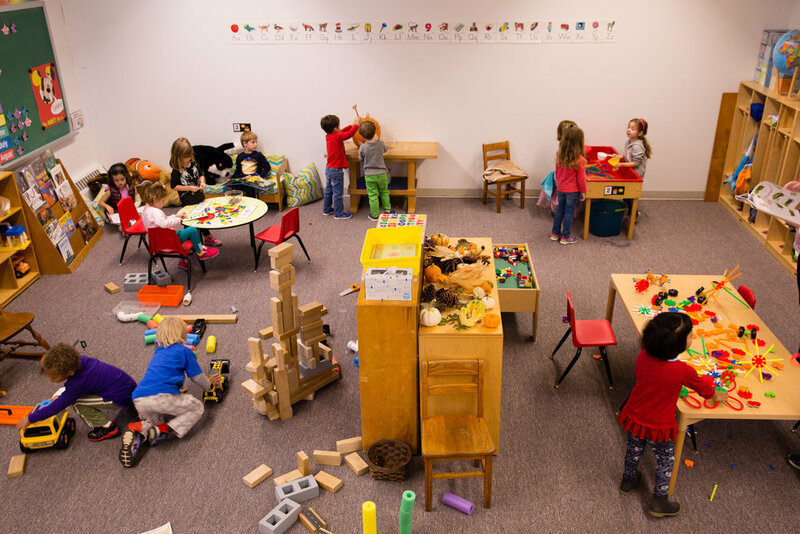 A large indoor playroom is available during inclement weather. Our children enjoy a nutritious mid-morning snack and lunch with their classmates. We provide the snack and the milk served at lunch. Your child should bring a bag lunch from home. Language Arts – the use of stories, finger plays and flannel boards help children make the first connection between the spoken word and the printed word. This also enhances vocabulary development, visual discrimination and alphabet recognition. Dramatic Play – encourages children to engage in imaginative and creative play, by exploring the roles of many different people. Math – counting, sorting, classifying, weighing and measuring, help children develop early math skills such as number concepts, number recognition and whole/part relationships. Manipulatives – puzzles, beads and other table toys help children develop eye-hand coordination, a skill needed for reading. Social Studies – celebrating holidays, field trips and visits from community workers (dentist, police, fire and rescue, 911) enhance a child’s awareness of the world around them. Art – arts and crafts, painting, drawing, coloring, cutting and gluing, encourage a child’s creative expression while reinforcing eye-hand coordination. Music – musical activities help children develop listening skills, improve attention span and coordination, as well as experiencing creative expression and an awareness of self. Health and Safety – children learn personal hygiene (hand-washing and bathroom skills) and personal safety, as well as learning to respect the safety of others. Notice of Nondiscrimination: 4CCN admits students of any race, color, national and ethnic origin to all the rights, privileges, programs, and activities generally accorded or made available to students at the school. It does not discriminate on the basis of race, color, national and ethnic origin in administration of its educational policies, admissions policies, scholarship and loan programs, and other school-administered programs.